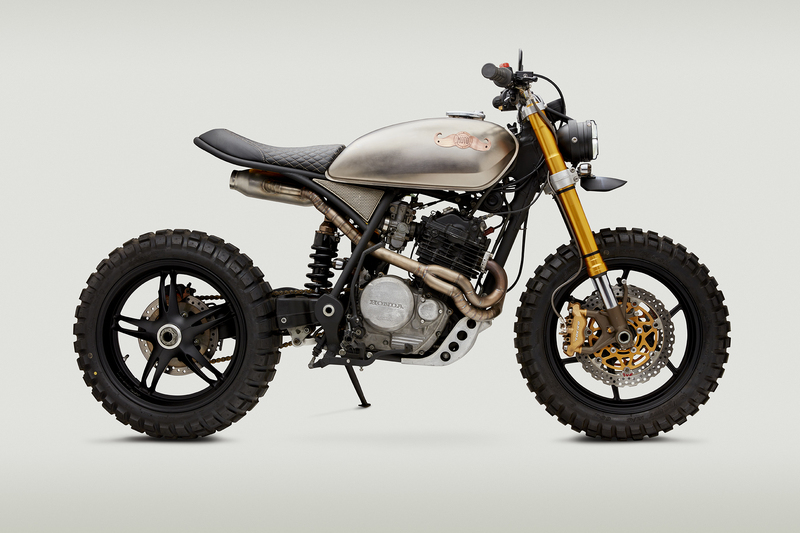 And what better way to clear your mind than sitting on a crazy custom dual-sport that can take you anywhere and do it in the unmistakable Classified Moto style. 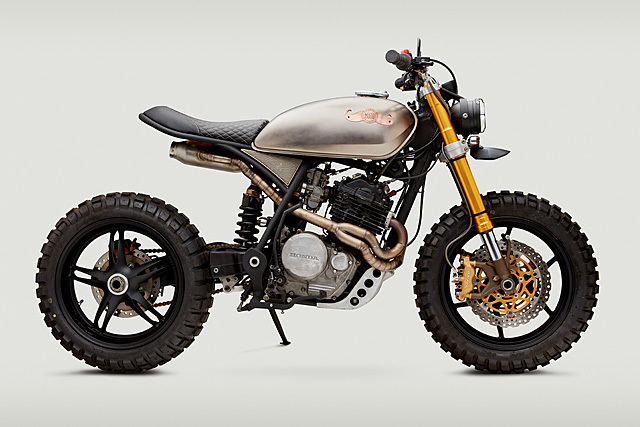 The original ’84 Honda might have started life as a dual purpose bike and the CM custom version finished off in the same general style, but it’s undergone plenty of changes along the way. First up the frame has been heavily chopped back and smoothed out before receiving a host of CM’s signature modifications. 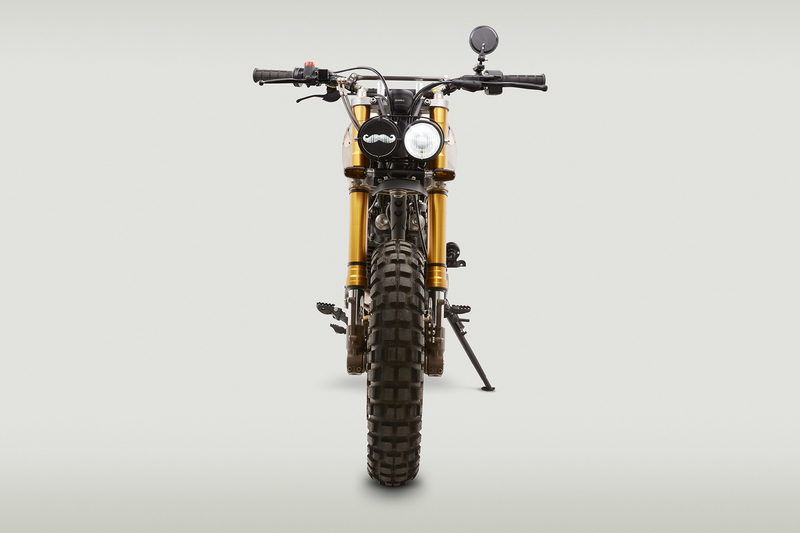 The first is the fabrication of an all new subframe that drastically shortens the look of the bike. All the plastics and the big seat of the original might be gone, but the new and improved version is meatier and more muscular than the stock bike could ever have claimed to be. 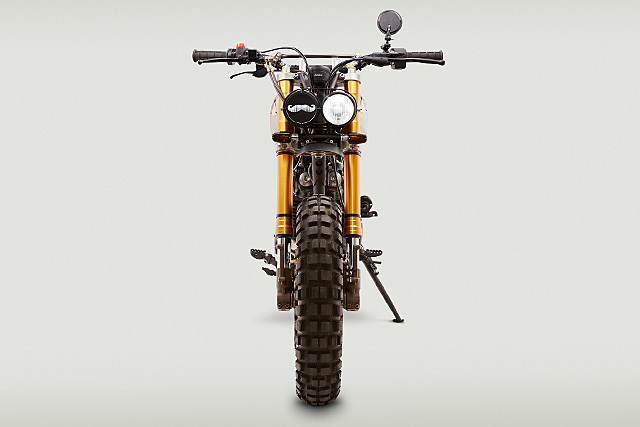 The bodywork is exactly what we’ve come to know and love from Classified Moto. 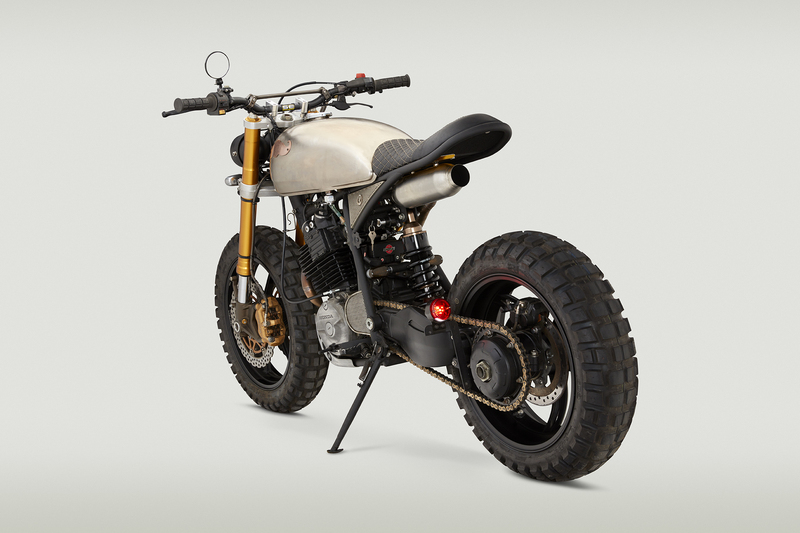 A Kawasaki KZ750 tank gets the signature CM treatment and Solarmill modified the traditional tank badges to include a moustache for the cause. Next to their tanks nothing says a Classified Moto build like the suspension setup and Movember XL gets the royal treatment. Out back the frame has been modified and strengthened to accept a 2006 Triumph Speed Triple single sided swingarm. This is then sprung by a big dollar Progressive Suspension 465 mono shock with remote adjustable preload. The Triumph also lends its disc brake setup, a drastic improvement over the tiny stock Honda 140mm drum. A Kenda Big Block tyre wraps around the Speed Triples wheel for a seriously aggressive look. 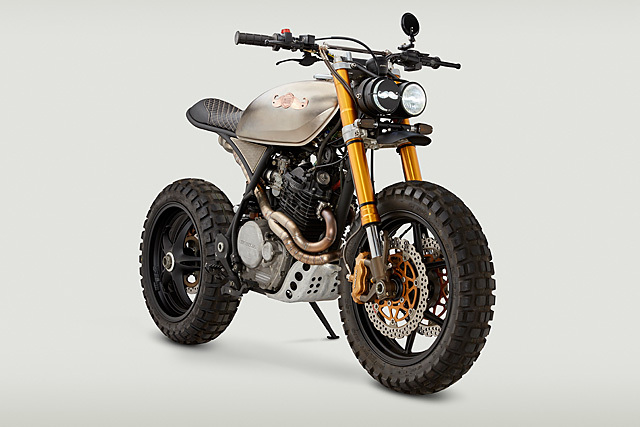 That road munching rubber is fitted up front as well to a Kawasaki ZX6R wheel and the package gives the Honda single a monster truck like brutality. 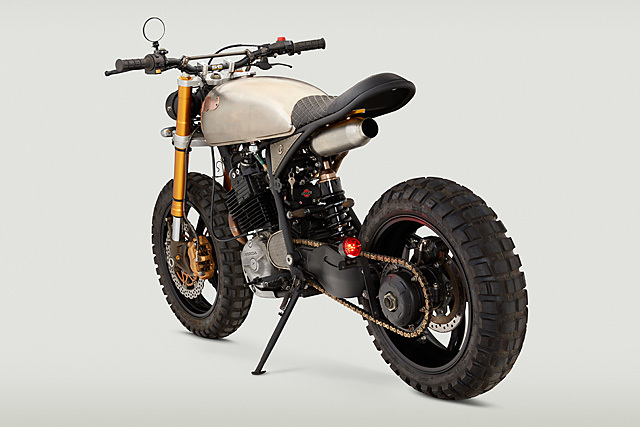 Classified Moto was one of the very first companies to regularly fit modern USD suspension to old frames. With the Movember build no exception thanks to a 2007 Kawasaki ZX6R front end with CM triple clamp conversion and CM’s own billet upper clamp. The Kwaka also donates its drilled petal discs measuring 300mm and Tokico calipers. Big brakes on this tiny package, she’ll haul up like an F1 car. 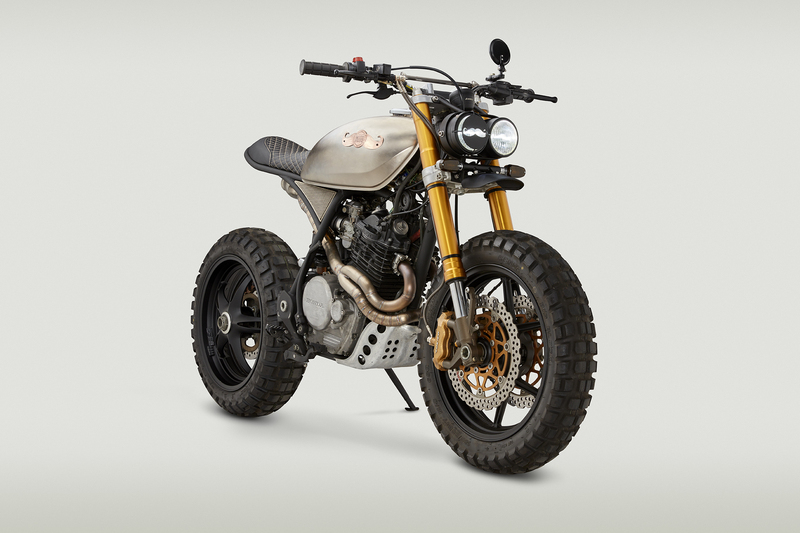 But first to get you up to speed Movember XL retains the brilliant Honda Single with 589cc and RFVC technology. The Honda thumper is all torque for fun at any RPM but keeping weight down means its kick-start only. “The XL600R is known for being tricky to start, so we spent a lot of time tweaking it so it would fire up easily.” CM’s Danik Herashchanka got it just right and a host of new gaskets, seals and O-rings means she runs as well as it looks. “We love that it’s still a blast on the pavement or off. The older I get, the more I just want to sit upright and have torque whenever I please. 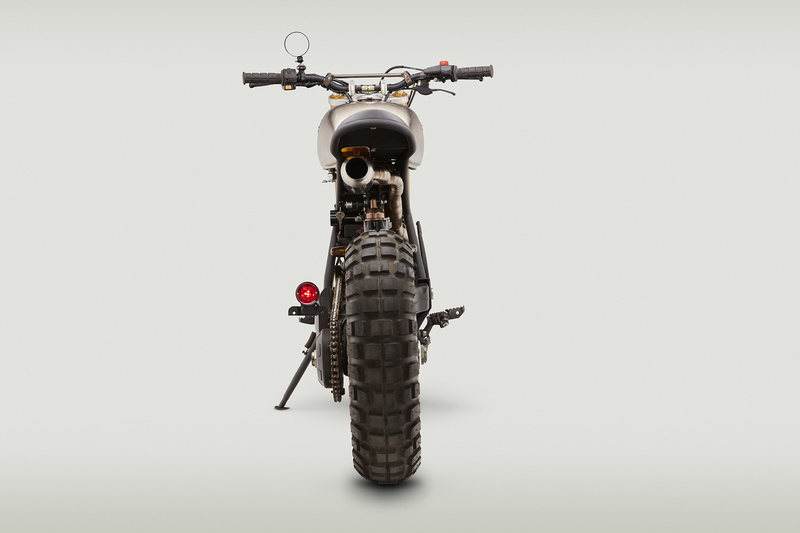 This bike fits the bill, for sure.” But if the torque of the single pleases the seat of the pants the ears get a thrill too. 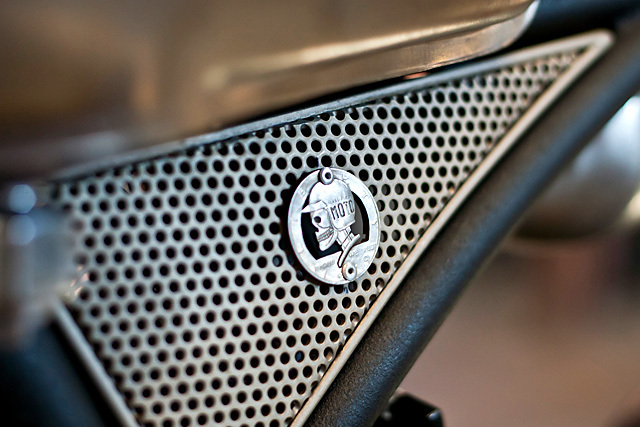 A custom-made Classified Moto stainless steel exhaust snakes its way through the frame maintaining a slim profile. 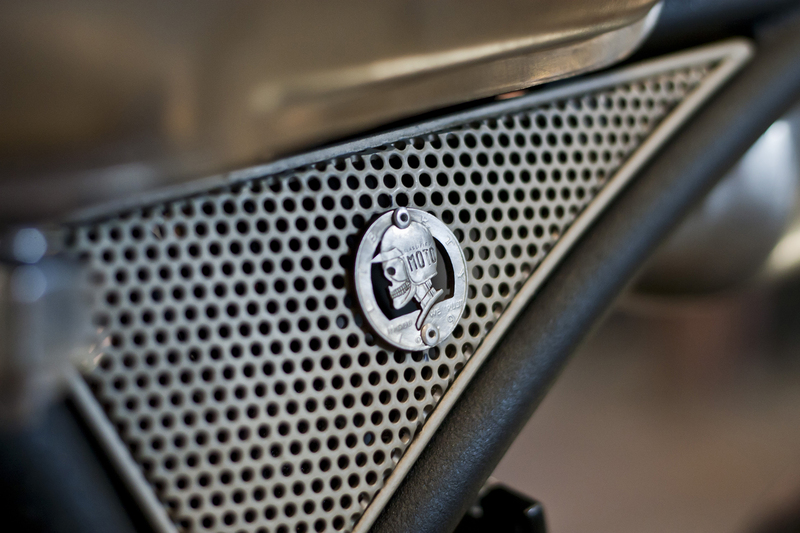 Under the seat it merges into a hand fabricated muffler that’ll snap, crackle and pop until the hairs of your Mo stand up! That seat is picture perfect, slim enough to main the designers brief while still padded well enough to provide comfort to riders big and small. Wrapped in black leather, diamond stitch for a high quality finish and hugging the lines of the frame make it another quality piece. Underneath sits a lightweight Shorai Power lithium-ion battery that is the start of an all new electrical system. Which is fired to life thanks to a relocated ignition switch that also finds a home under the subframe. Keeping the slim profile the front and rear indicators are cleverly mounted so they don’t protrude outside the lines of the body. 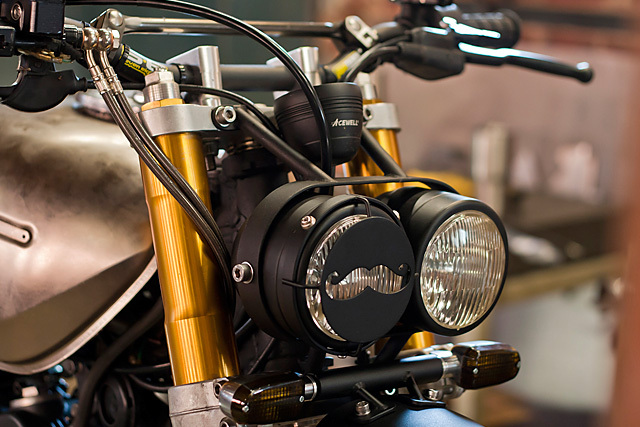 To light the way a twin headlight setup gets another special touch for Movember. Winking at oncoming traffic through a moustache cut-out that’s part The Sheriff and part El Bandito. Mounted just below is a tiny front fender that catches the roads debris like the flavour saver it neatly resembles. And to keep the rear end clean the brake light is mounted down on the side of the single-sided swingarm with a numberplate holder ready for the new owner’s license plate. Mounted so close to the rear sprocket the brake light illuminates the chain that is shielded with a hand formed cover. 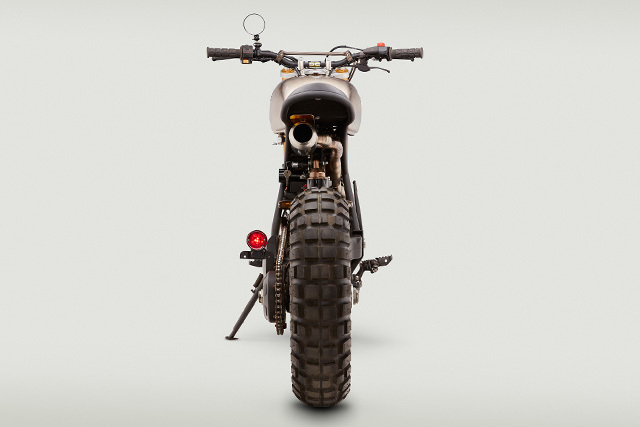 While under the engine a neatly punched bash plate lets you charge at rocky terrain without fear of puncturing the motor. And John’s made sure that lucky winner will be comfy at the controls with new Oury grips mounted on a set of Pro Taper SE bars. Which if you peer over you’ll be given all the information you need thanks to the single Acewell speedo. 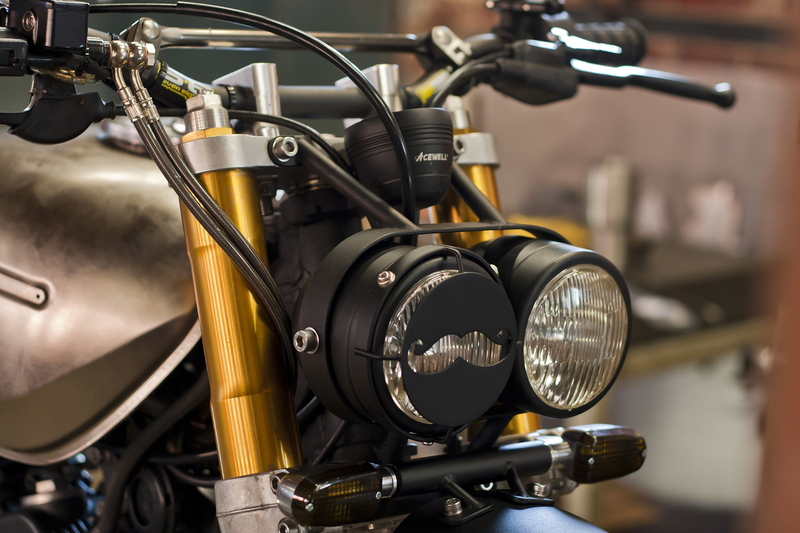 “Anyone who raises at least $50 for the cause is entered to win the bike after it finishes its tour with the Progressive International Motorcycle Shows.” So whether you’re taking part in Movember, throwing your mate rocking his new Fu Manchu a few dollars towards the cause or just admiring the latest brilliant build from Virginia’s Classified Moto; there is no better time to think about Men’s health, chat to your friends about it and take yourself to the Doctor should you need a helping hand, so to speak.